From our Teardrops Collection: This beaded fringe trim sparkles like diamonds and onyx! 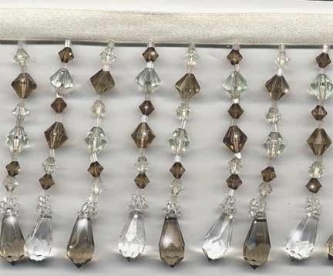 It has translucent "extremely pale" taupe tinted (almost looks crystal-clear) faceted teardrops beads, alternating with crystal clear beads and rich opaque faceted ebony black teardrop and bicone beads. Each strand sparkles with accents of gold seed beads and copper bugle beads. Exceptional detail and craftsmanship with high quality crystal clear acrylic beads. Each beaded strand is 3" long, including the 3/8" rich beige satin ribbon. Even bottom. 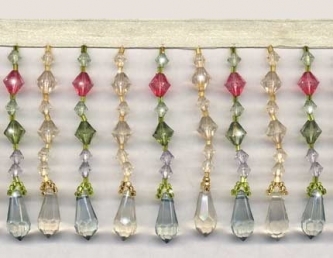 From our Teardrops Collection: This is an exquisite Beaded Fringe trim in translucent crystal clear and "barely-there" pale, pale rose beige faceted acrylic teardrop beads and bicone beads. The trim has glistening accents of gold seed beads and gold bugle beads. This fringe is remarkably soft in color and, overall, appears as a pale ivory beige. Exceptional detail and craftsmanship. 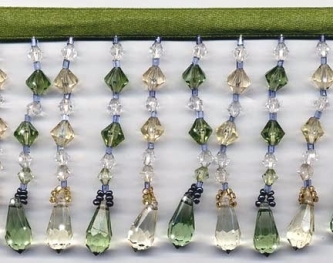 Each beaded strand is 3" long, including the 3/8" satin ribbon. Even bottom. 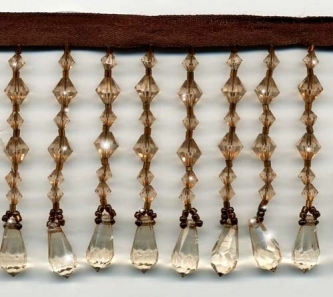 From our Teardrops Collection: A lovely Beaded Fringe trim in translucent pale copper brown faceted teardrop beads, accented with coppery bronze seed beads and bugle beads. Exceptional detail and craftsmanship. Each beaded strand is 3" long, including the 3/8" rich brown satin ribbon. Even bottom.